WARNING: I've been posting on Homer's Travels for nearly nine and a half years now and I have successfully stayed away from posting about politics. In those nine plus years I have posted eleven times about politics and six of those were posts asking people to get out and vote. I apologize in advance for the rant that follows. I have re-immersed myself into the twenty-four hour news cycle. In other words I am up to my eyeballs in politics. If this election weren't for the Presidency of the United States of America, I would be enjoying every hilarious minute of it. This election cycle, though, is different. I watch the news with a sinking sense of impending doom but I can't turn my eyes away ... much like a train wreck. Disappointment, depression, disbelief, and embarrassment - I have never truly experienced these feelings with respect to our elections until now. What must the people around the world think of us, the "Leaders of the Free World"? T@#$p, C@#z ... Really? B@#$%e, H@#$%^y ... that's the best we have? All candidates are human. I know that. All humans have flaws. The trick with our elections has always been to pick the candidate with the fewest flaws and the most potential. All of these candidates ... all of them ... have more flaws than potential in my opinion. Will any of these yahoos be able to make a difference? Will any of them be able to make a positive change? One party seems dead set for reversing the meager progress that has been made in the past ten to twenty years. At the same time their own candidates are disliked by many of their own party. The other party would try to build on the progress made but would find itself fighting the same forces of DUH that is opposing the current President. How will it all change? Will the undercurrent of racism be exchanged for sexism or anti-semitism? Will partisanship expand while empathy fades from existence? Will we have more anti-intellectualism? More dismissal of science? Will another four years be wasted fighting the forces of DUH? Eight years ago I had guarded hope. Who would have thunk I had too much hope and wasn't guarded enough? The process of electing our next President begins tomorrow. I'm not a religious man but all I can think is 'Lord help us all'. #ThisYearsElectionIsALotLike finding out it wasn't just a fart. 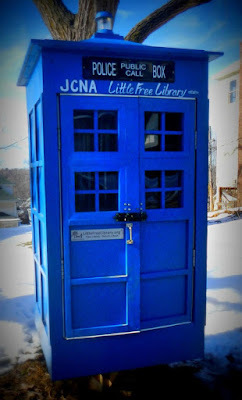 Photograph: "Timey, Wimey ... Booky, Wooky"
"Timey, Wimey ... Booky, Wooky"
Saw this on my walk today. 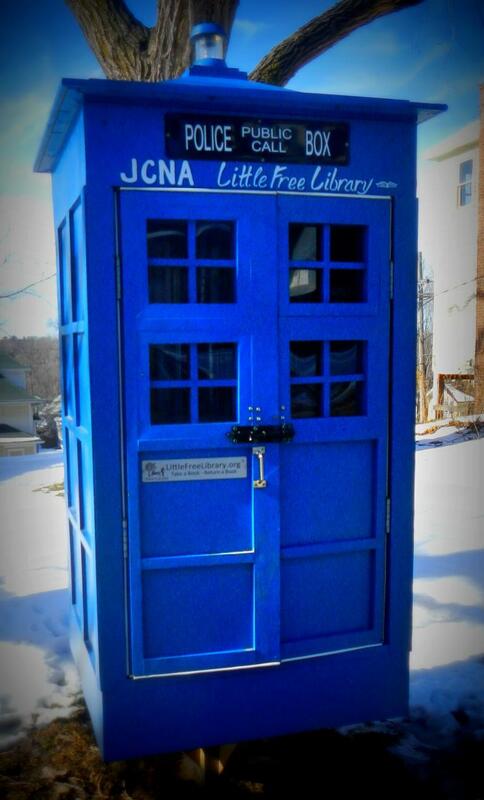 I've seen several Little Free Libraries in the Omaha area but this one made my inner ... and outer ... geek smile. I didn't check to see if it was bigger inside than out. Then came the Halloween event. The Hallows event, as it was called, started a week before Thanksgiving (Yeah ... a Halloween event three weeks after Halloween ... the game developers were weird like that). During this two week event better equipment and better ships were provided if you were lucky enough or if you spent money to buy more chances. The event turned the game into a bigger game of chance than it had been before. Money. You didn't need money to play the game but spending money meant you got more toys, faster. People who spent a lot were known as coiners. During the Hallows event the ultimate reward for coiners were the blueprints for a starship called the Valkyrie. The Valky was one of the best ships you could get. The blueprints also costed $800. Yes, that is in US dollars. I knew of four coiners who bought them. I prided myself for having a strong fleet without spending any money. Having said that, many smaller players, and players who had not played as long as others, jumped ahead during this event. Low level players were flying around with starships that they probably shouldn't have had for several more weeks. This irritated a few long term players. I was bothered - it was unfair - but it wasn't a big deal since I also benefited from the Hallows event. Two weeks after the Hallows event ended the Christmas event started. With this one there was new, better equipments and even better starships. The starships included a version of the Valky (we called it a HOHO Valky). The HOHO Valky was not only better than the $800 version, but it was very easy to get one ... without spending any real money. To make it worse, the game developers, who often provided compensation if the game malfunctioned for an extended period of time (which happened way too often), provided a compensation package that gave EVERYONE a HOHO Valky. At the end of the Christmas event many people had fleets made up entirely of HOHO Valkies (I had four myself). At the end of the Christmas event my fleet was still big but it was getting passed by other players who had been luckier than me. Not wanting to become too far behind I'd bought a monthly card for $9.99 which provided needed resources and credits each day for a month. I bought it near the beginning of the Christmas event. While the monthly card helped a lot it didn't make me any luckier. It did make me a minor coiner which, frankly, made me feel guilty and a bit dirty. The events changed the game. The game had been a game of long term planning and strategically spent credits (players received credits free in game for doing tasks). There had always been luck driven parts of the game but the events turned the game into a casino. Spend money, spin the wheel (yes, there was a wheel to spin to get prizes), and, if you were lucky, you got better stuff than other players. Long term goals had been replaced with short term lucks of the draw. Near the end of the Christmas event I realized that, not only was the game no longer fair, but it was becoming a repetitive chore. The fun was not there like it had been early on. I set a deadline of the end on my monthly card to decide if I wanted to continue playing. As that deadline approached I took stock of what I'd done during the last six months. I'd met my duties as a house husband but I realized I was just doing the minimum necessary so that I could spend more time gaming. During family functions I would sneak into the den to check on the game and make sure I got the points and resources I needed. I'd slept in only one (!) morning in the last six months getting up at 6:00AM everyday to play the game. The first thought I had when I woke up each morning was "What do I need to do in the game today?" The game was usually the last thing I thought about when I went to bed. I would become irritated if something interrupted my game play. I started cutting back on the hours I played but the game was always in my thoughts when I was away from the computer screen. I stopped watching the news. I stopped following social media. I practically missed autumn entirely. Everything was revolving around the game. The Real World was the inconvenient place I occupied when I wasn't gaming. I had become obsessed. This game had become the closest thing to an addiction that I have ever experienced. I've played other games nearly this obsessively but those games always had an endgame. They were never social. When the game ended I would come down and would return to reality. This game had no end and it had a social element. I was not prepared to handle it. Near the end it started appearing that another event with new ships and equipment was coming, probably a valentine's day event. This was too much for me. Last Monday I announced to the other players that Wednesday, the last day of my monthly card, would be my last day. Other players tried to convince me to change my mind, suggesting that I step away for a short while. Others seemed a little disappointed. My own feelings surprised me. Imagine what it feels like to be quitting heroin and learning your best friend had just died - that's kind of how I felt. I teared up a little. My emotional reaction was the final straw. Such an emotional reaction about a game is not healthy and the only option I had was to quit. The game is still in my thoughts everyday but they are fading. As I told my friends: I won't miss the game, I will miss the players. To ease myself away from the game I friended a few players on Facebook so some of the friendships I developed could continue. This made it easier to quit. The computer remained off the morning after I quit. Frankly, I was afraid to turn it on - an alcoholic entering a bar. I finally turned it on to draft this post and the last. The temptation to log onto the game is there. But now I am free. I am free to start getting my health back. I am free to prepare for the Appalachian Trail. I am free to reconnect. Most importantly, I am free to enjoy the Real World around me. Last summer, a week before RAGBRAI, I started playing the game. I've mentioned it in passing a few time in the last six month. The game was called Star Trek: Alien Domain (STAD). STAD was loosely based on Star Trek. You started with a home planet and you built a colony, adding mines, labs, storage, and shipyards. Eventually you built starships and fleets of starships and explored the sectors of "fluidic space". You established new colonies which provided more resources you could use to upgrade and strengthen your fleet. As you explored you gained experience which allowed your character to go up in level and opened up new sectors to explore and starships to be built. My character was a member of the Federation. As you explored you battled the fleets of other players who had chosen to be Klingons. Along with the resources generated from your colonies, you also gained resources by looting Klingon player colonies. Equipment like weapons and shields were obtained by opening crates that you found while exploring. What you got out of the crates was random - luck was a very important part of the game. The crates made the game a game of chance but it often didn't feel like it to me. I started playing the week before RAGBRAI and in those first five or six days I became hooked. I was planning how to gain experience as fast as possible while optimizing the gathering of resources I would need to get the next starship class. As I rode my bike through the backroads of Iowa my thoughts often went to the strategy I would use when I got back home. Yeah, thinking about riding a bicycle across Iowa was not enough of a distraction for me. The game always wormed it's way to the front of my mind. After RAGBRAI was over I jumped back into the game for another five days. I sunk deeper and spent more time playing. A week after RAGBRAI I left on my Rocky Mountain National Park (RMNP) camping trip. Like biking RAGBRAI, hiking through the beautiful mountains of RMNP was not enough to stop me from thinking about the game. Part of me just wanted to get home so I could build the next starship and explore the next sector. After returning from RMNP I went off the deep end. I stopped all the exercise and training that I'd been doing prior to RAGBRAI and RMNP. I knew this would happen. I figured I would pause my training for a month before restarting it as Appalachian Trail training. That one month power down replaced exercise and training with gaming. I would get up at 6:00AM when I normally would get up to feed Iago but, instead of exercising, making breakfast, and watching the news/checking social media, I would sit in front of the computer and play the game. A month after RMNP I didn't restart anything. The game, by this time, had sunk it's claws in me and I was spending between six and twelve hours a day playing the game. I did my chores and did what was needed to keep the house but the rest of my time was dedicated to the game. The game was similar to many games I've played before. There was one aspect, though, that was new to me. This game was an MMO (Massively Multiplayer Online). In the lower left corner of the screen was a chat window. You were not playing the game alone. You were playing with a community of Feds and KDF (Klingon Defense Forces) who were chatting with each other while they played. At first I ignored the chat window but after a while I saw that it was full of important information. Players were exchanging hints, tips, and trick about the game. When I ran into roadblocks I began posting questions to the chat and answers usually showed up in a few minutes. Before long I became a full fledge member of this STAD community both getting and giving answers. Over time friendships formed. I would describe them as being like workplace friends. You 'saw' each other when you played the game, talked mostly about the game, joked around a lot, and didn't socialize much outside of the game. That was OK since I was socializing with them most of my waking hours anyway. STAD was a new game and was not complete. When I started there were only seventy levels you could reach and only sixteen sectors you could explore. I reached level seventy sometime in September joining a lot of older players who had languished at the level cap for over a month. Even with the level cap you could still upgrade your fleet and make it stronger for battling against other players during group melees called System Battles. My fleet strength grew quickly and I slowly gained the respect of some of the other players. There was little player vs player (pvp) fighting in the game. Early on I lost my fleet several times to marauding Klingon but over time the Feds and Klingons chatted with each other, we enjoyed each other's company, and the number of Klingon/Fed attacks dropped a lot. I found myself helping some newer Klingon players to improve their fleets and offering them advice on playing the game. Some of the old timers would still attack Klingons on sight but I would usually leave them alone if they left me alone. In general, the players were great people. There was little conflict. When the game changed and began requiring the Feds/Klingons to attack one another once a day to get prizes, players would politely ask the other faction if they could be attacked for the daily reward. The smallest, weakest fleets would be loaded up so both the Fed and the Klingon could meet their daily requirements with the least amount of wasted resources. It was very gentlemanly. In early October the game was updated and the cap was raised to seventy-five levels. Three more sectors were open up to exploration. Two months later most of the big players, myself included, hit the cap again. But I was still having fun and by then I was playing more for the chat with other players than for the game play. We all chatted, wondering when the cap would be lifted again, joking around, and discussing how to make our fleets stronger. Then came the Halloween event. It's nine days into 2016 and I haven't made my reading goals yet. Well, they weren't made as of yesterday. Now I have plans. Last year I read twenty-five books, just one shy of my goal. This year I expect to read fewer books. There always seems to be something competing for my attention and time. I've noticed a pattern in my reading. I start the year with an intensity, reading half my books in the first three to four months before my reading tails off. I end up spending November and December trying to catch up. Last year the pattern repeated itself with the addition of me completely neglecting my magazine reading as well. I have an eight month high stack of Wired and National Geographics towering on the corner of my nightstand. So it's time for me to do some catch up. I will spend the first few months of the year working my way through the stack of magazines. Once the magazines are gone, then I will start tackling books. I will also set a much lower reading goal - half of what I set last year. So the next month will be full of short form culture, science, nature, and technology ... a few of my favorite things. Then, if I get my act together, I'll decimate my reading goals and surpass my own expectations. The past few days have been a bit odd feeling. Usually I like the feel of New Year's Eve and New Year's Day but this year I was a little bit grumpy for no real reason. The Wife and one of her nieces left on Wednesday to roadtrip to Arizona to cheer on Notre Dame at the Fiesta Bowl. This left me and Iago to our own devices. On New Year's Eve I played a little, read a little, and caught up on the latest season of "The Walking Dead". I considered going to see the lights and fireworks downtown but just wasn't in the mood. I ended the day as I usually do by watching the clock next to the bed change over and turning out the light. The difference was I didn't have the Wife to kiss and wish Happy New Year. On New Year's Day I took down some of the Christmas decoration and lit the candle for Notre Dame. It didn't work but it sounds like the Wife and niece still had a fun time at the Fiesta Bowl. I started watching a new show on Amazon Prime ("The Man in the High Castle"). It's an interesting story. Today I was going to ride my bike in an attempt to kick start my exercise routine that I've been neglecting. I didn't. Tomorrow I will ... I promise. Instead I finished taking down the outside lights (some were frozen to the gutter) and watched several more episodes of the Man in the High Castle. So the past three days have been a bit aimless and uninspiring. That will have to change soon.